UPDATE: offered furnished at listed price. Upon arrival, experience the exquisite leaded glass, double front doors of this highly desirable southern facing, lakefront custom home built by Todd Johnson. The exceptional design showcases 3 bedrooms, 3 baths, formal sitting and dining rooms, and a study with superb views of the lake. Delight in the abundant wildlife in this quiet setting on the spacious patio featuring "Old Country" pavers and balustrades. Swim in the heated, sunny pool or relax in the shade of the two covered lanais. Built for entertaining, this home has a uniquely designed sunken bar in the large family room, complete with a gas fireplace and disappearing sliding glass doors. The kitchen boasts Silestone counters, a breakfast bar, built-in desk, and kitchen to lanai pass-through. A perfect retreat, the master suite opens to the lanai through disappearing sliders, and includes two large walk-in closet. The spacious master bath has a newly tiled walk-in shower, a grand soaking tub, and new dual vessel sinks, along with new granite counters and custom cabinets. Relish the 3 car, side entry garage with tons of storage and two air conditioned closets. 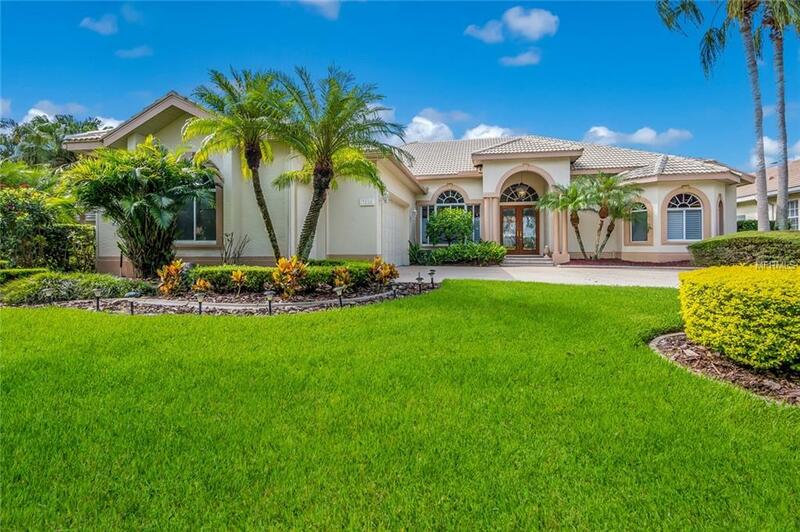 Experience life in this gated, country club community with its sporty clubhouse, fitness center, tennis courts, four star 27 hole golf course, and croquet courts. Excellent location just west of I-75, surrounded by shopping, restaurants, and the UTC mall with easy access to the Sarasota/Bradenton airport , the beaches, downtown Sarasota and more.